I seldom agree with Leonard Pitts, but today he has a good suggestion. 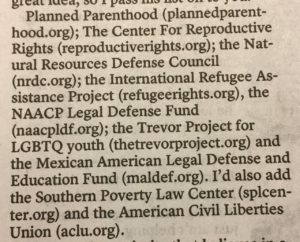 He is very upset about the election of Donald Trump and lists a number of organizations, from another source, that seem to support things to which Mr. Trump is apparently opposed. (I’m using the wishy washy language because Mr. Trump is not ideologically driven and it seems to me that we cannot yet be sure just what his positions are.) Pitts’s suggestion is that folks who oppose Mr. Trump should make donations to those organizations. Pitts is exactly right because donations from individuals rather from the federal government should be the only source of funds for controversial organizations such as Planned Parenthood. As a matter of fact, no non-profits, regardless of political slant, should receive tax revenues and borrowed money directly from the government. It is more than enough that they are granted non-profit status, thereby gaining significant tax benefits and the right to accept deductible donations. So, if you are upset about Mr. Trump, open your check book, make a donation, take the deduction, and reduce your tax bill. By doing so, you force those who don’t support the organization to help a little bit by making up for your reduced tax bill. I should admit that I also am upset with the results of the election, but favor a different approach and am a little bit hopeful about that. I’m in favor of eliminating all those tax deductions in return for much lower tax rates that will be fair to all of us. I’ll gladly continue donating, even without the tax deductions, to organizations I support in return for such a great improvement to our ridiculously complex and unfair tax code. And the organizations will still get their favorable tax treatment. So, if Mr. Trump pushes such a freedom-expanding program, I will be less upset than I am now. Here is the list Mr. Pitts recommends. Next Post Syria Following US Example?